"Taking Care of Business" is what I was doing during these events. I went to many events around the country most of which were Veteran reunions or gatherings. Here you will find some of the photos of the events I either attended or spoke at. More pictures will be added as I come across them in my files again. Be sure to click on each picture to see them better. I'm not doing any events anymore for various reasons but I did address the Womens Army Corps Veterans Association (WACVA) convention that was held at the Embassy Suites in Tampa, FL in August 2010. I had a great time while there and covered many topics but especially trying to convince these women to get their military histories written down for future generations to learn what they experienced. Thanks to Gloria Vinsky for asking me to attend and speak to this group of which I'm a Member-at-Large. Special thanks to Pat Jernigan for providing me with this photo. In November 2005 I spoke at the Veterans Day ceremony at the Naval Support Activity in Philadelphia. What a wonderful day as I also met other women Veterans who never told their story before and received a beautiful plaque! But in July I did another Women Veterans Forum. Those photos are on my Veterans page. However one young woman isn't a Veteran YET but she started this program and I thought her photo should be shared with you as her essay about patriotism won the Elks Club award. So here is a photo of Mackenzie Waterston that was taken by her grandmother Terry Waterston--a former woman Marine. I was asked to moderate a Women Veterans Round Table which was being taped for a PBS or school documentary. The taping took place at VFW Post 2475 in Glens Falls, NY in May 2005. Some of the women who took part can be found on my Veterans page. Photo by Terry Waterston. 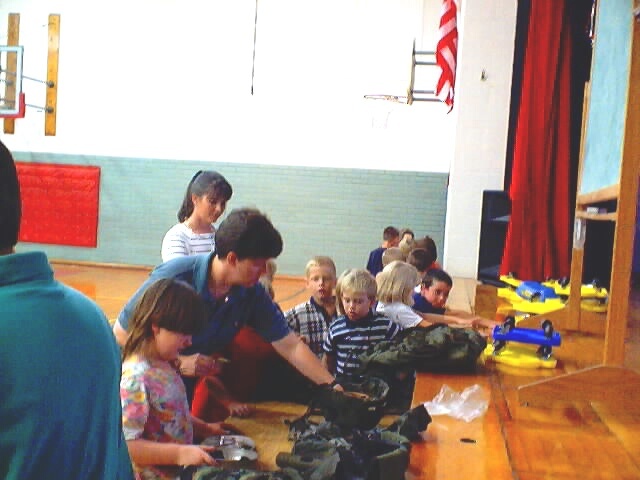 Another session was held in October 2005 with women Veterans of Operation Iraqi Freedom. Those photos can be found on my Veterans page! 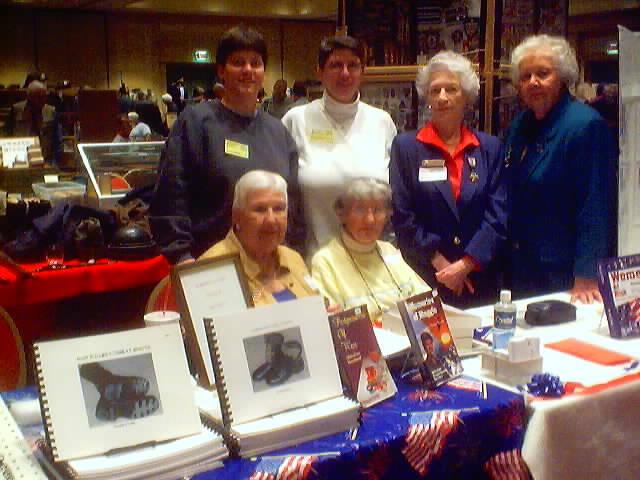 In November 2002 I was invited to appear at the Tennessee Military Collectors Association Fall Show for a booksigning. While there I got to meet several other women Vets. This photo shows six of us Veterans together. Standing L-R is Pam Waterston, me, Margery Coventry and Harriett Howard. Sitting L-R is Margaret Salm and Ann Doyle. Another photo can be found on my Veterans page. 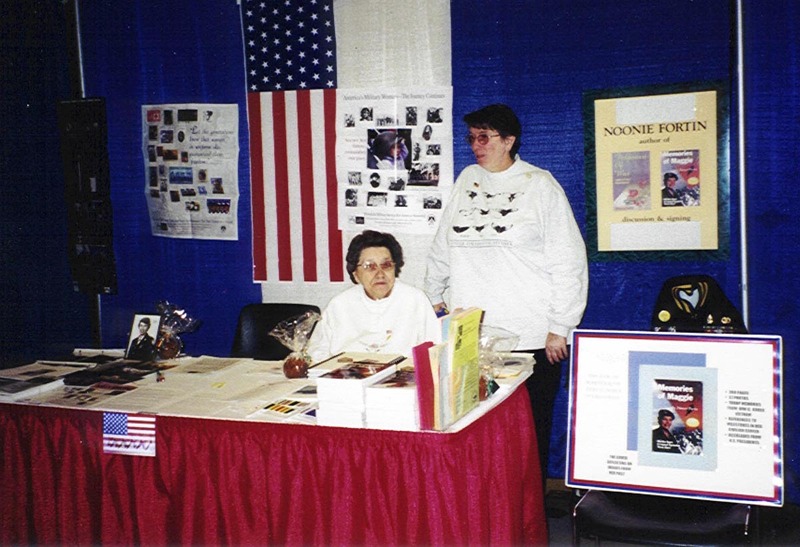 I was asked to set up a table at the end of October 2001 at the Saratoga City Center for a Veterans gathering. That's my mother sitting next to me. Photo by Terry Waterston. 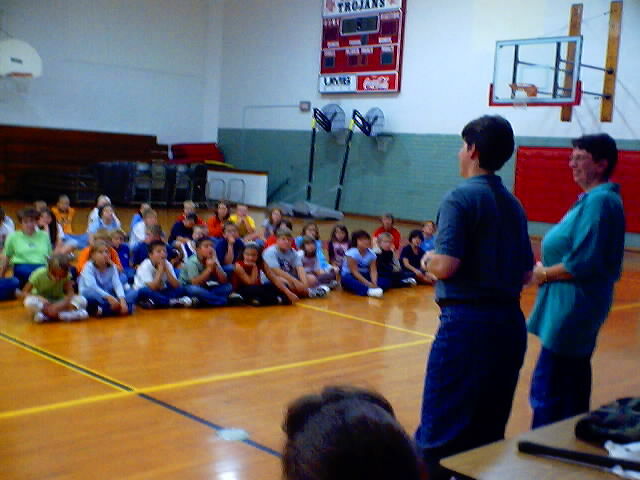 September 2001 found me speaking to K-6th grade students at Nodaway-Holt Elementary School in Maitland, MO. My friend Pam Waterston, a Gulf War Vet, assisted me and spoke also of her experience as a combat Veteran. These photos were taken by Katie Hoelscher. 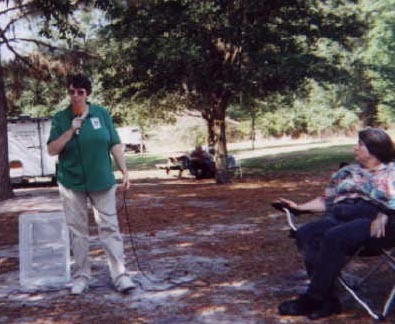 Here is a picture of me speaking in April 2001 in Tampa, FL at the Women That Served tent while The Moving Wall was on display. I was joined by many other women Veterans for this special day and many of them spoke also. This photo was taken by Christina Sharik. "Storytelling" on Memorial Day 2000 at the Vietnam Women's Memorial in Washington, DC. Photo by John Voracek. John also managed to catch three women Veterans in this picture. Standing next to me is Pam Waterston who served with the US Army in Saudi Arabia during the Gulf War and then in the US Army Reserve. Seated next to Pam's elbow wearing the striped blouse is Brenda Allen who went to Vietnam as an entertainer. The next photo was taken in Bolton Landing, NY in 1999. That is the back side of three of our New York State Gold Star Mothers. My mother took this picture.